FRENCH AIR TRAFFIC controllers have ended a two-day strike that was supposed to run till the weekend after marathon talks with the government, unions said. The strike, which stranded hundreds of passengers, was called off after the government recognised the “importance of investment in the sector,” said the Unsa-ICNA union which launched the protest. Some 600 passengers were stranded today in Orly airport, south of Paris, an airport source said. They included about 200 people, most of whom had been due to travel with low cost airline Vueling, to Spain and Portugal and were forced to spend the night of Tuesday to Wednesday in Orly. The strike, which kicked off yesterday, was due to last until Sunday with some air traffic controllers protesting against what they say is a lack of sufficient funding for a sector in dire need of modernisation. But as union officials held talks with the government, there was already a sign of significant progress. Before the strike was called off, France’s civil aviation body predicted a “marked improvement” on Thursday and that “95 percent of the flights will function”. 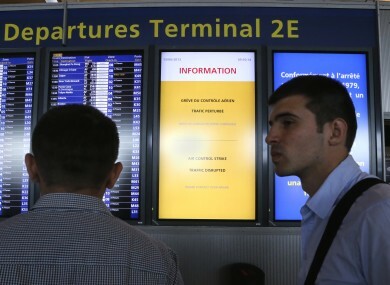 The body said around one in five flights going to and from several cities in southern France, or taking off from Paris to the south, Spain, Portugal, Morocco, Tunisia and Algeria, were cancelled today – the same situation as the previous day. The scores of flights cancelled Wednesday included those of Air France and budget carriers EasyJet and Ryanair. The strike has been blasted by airlines and trade groups, with the International Air Transport Association condemning “unions bent on stopping progress” at the height of the tourist season in France. Air traffic controllers involved in the action want airport fees for airlines to increase by 10 percent, but companies want them to go down and the government is caught in between. The SNCTA, the country’s biggest air traffic control union, decided not to go on strike following last-ditch negotiations with the government but has echoed mounting concerns that French air navigation tools are becoming dangerously obsolete. The system used in the country to enhance radar monitoring and for separation of air traffic dates back to the 1980s, and is due to be replaced by a new system. The tools used to control air traffic are also in need of change. According to the SNCTA, for instance, all radar screens in the Aix-en-Provence control centre in southern France were recently “urgently” changed after around 20 screens suddenly went blank over the space of 18 months. Email “French air traffic controllers end their strike after two days”. Feedback on “French air traffic controllers end their strike after two days”.